DAS-1028A is an octal asynchronous serial communication controller based on a PMC form factor. 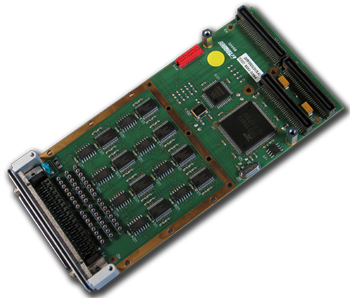 The DAS-1028A module is compatible with the PCI specification 2.2 and run on 32-bit bus size at 33 MHz frequency. Data transfers operation can be formatted in 8-bit, 16-bit, 24-bit or 32-bit wide. TheDAS-1028A provides 8 enhanced 16C550 (5th gen) UARTs with the PCI Bus interface. Half and full duplex mode are supported with RS-485 interface for point-to-point and multi-drop bus configuration..
Each UART has its own 64 Byte of transmit and receive FIFO, a set of 16C550 compatible control and status registers, and a baud rate generator for individual channel data rate setting. RS-232 and RS-422/485 programmable interface, with half and full duplex modes support. RS-232 signals: TxD,RxD,RTS,CTS,DTR,DSR,DCD. RS-422/485 signals: RxD,RxD. 15 kV ESD protection.